Mark Cavendish won the opening stage of the 2013 Giro d’Italia and took the pink jersey today in Naples despite a rough and tough day. A crash split the peloton and Omega Pharma-QuickStep team-mate Gert Steegmans suffered a mechanical in the lead-out. Cavendish’s run to the line was nearly spoiled. Frenchman Jérôme Pineau and Belgian Gert Steegmans crashed during the 130km run in Naples. Due to another crash, the group fractured in the final two kilometres. Cavendish and Steegmans left with about 10 rivals. It was perfect, but during Steegmans’ lead-out something else went wrong. “Maybe due to my crash before, something happened to my derailleur. I wanted to change gears and suddenly it pops on the 39. I wanted to change from 12 to 11 [in back], but instead the chain drops to the 39 on the front,” Steegmans told Cycling Weekly. 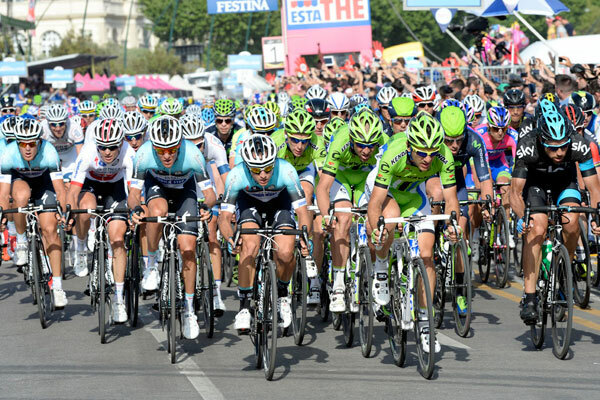 Omega Pharma lived stressful days heading into the Giro d’Italia. Cavendish’s sprint train suffered a few times in Tirreno-Adriatico and Scheldeprijs. After Scheldeprijs, the team admitted it needed to work on its train or sign riders who could do the job. Team boss, Patrick Lefevere tried to bring in recently-retired Alessandro Petacchi, but instead had to rely on his current troops. He told Cycling Weekly today the idea was to have Iljo Keisse, Matteo Trentin and Steegmans, in that order, lead Cavendish. In the final 10 kilometres, the race seemed to swing in favour of rival teams Orica-GreenEdge (for Matt Goss) and Cannondale (Elia Viviani). Steegmans explained that he was not worried. “In the last week we had a s**t-load of discussions about how to do [the lead out],” said Steegmans. “We explained that when [other teams] go with three kilometres with only four guys, don’t worry, they won’t make it. That was what you saw with Orica and Cannondale, they couldn’t make it. You need four guys with one-km out! In the next few days, starting with Wednesday in Matera, Steegmans expects the team to take greater control.